A high-level operative within the al-Qaeda in the Islamic Maghreb [AQIM] terrorist group, an offshoot of the Al-Qaeda network, signals his desire to defect to the West and reveal AQIM’s plans for spreading mayhem in North Africa and Europe. Suicide bombings and kidnappings are on AQIM’s agenda and Britain’s Secret Intelligence Service [MI6] signal their willingness to guarantee the defector’s future security in exchange for his key insider intelligence. The defector sends an envoy to London to negotiate the final terms of the deal and a young MI6 probationary agent accompanies the envoy back to Morocco to plan the logistics of the betrayal. On the Francisco de Goya, the luxury Paris-Madrid night train, the Arab envoy is assassinated. MI6 are as mystified as the Spanish railway police and Spain’s intelligence service. Sebastian Micklethwait, the neophyte secret agent, is ordered to proceed to Tangier once he has extricated himself from the Spanish authorities. Enter Michael Vaux, ex-journalist and occasional MI6 secret agent, who is in Tangier, house-sitting for an ex-lover. Sir Nigel Adair, head of MI6’s Department B3, whose remit is to facilitate the defection of the AQIM operative, pleads with Vaux to once again serve queen and country to help the spy agency locate the would-be defector and secure his safe passage to the UK. Vaux, reluctant to ‘come in from the cold’, finally agrees [Sir Nigel offers an attractive compensation package for Vaux’s patriotism] to help facilitate the safe exfiltration of a top AQIM functionary. On Vaux’s suggestion, Micklethwait, checks into a five-star hotel in Tangier, a move Vaux thinks will lead to the defector’s contacting the man who had escorted the now deceased envoy on the trip back to Morocco. 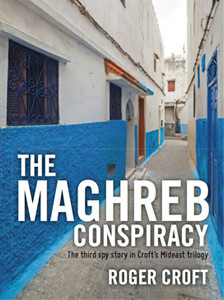 But within a few days of his arrival, Micklethwait is abducted outside a nightclub on Tangier’s busy, sultry Corniche. Vaux is now faced with the task of finding both the missing MI6 agent and the would-be defector. The quest to free the MI6’s probationary agent and to find the high-value AQIM defector propels Vaux into a labyrinthine and complex covert world as twisted and convoluted as any medieval Arab medina.